Once you’ve cooked up some beetroot, these soft and gooey beetroot orange brownies are a cinch to make. They taste really good with a noticeable orange flavour and they have a delightful purple hue. Along with the courgette glut in August and September this year, I ended up with a beetroot one too. This was good news. Last year was such a rubbish one down at the plot, we hardly got any courgettes and even less beetroot. So I was very pleased to be able to puzzle over what I could turn my surplus beets into. 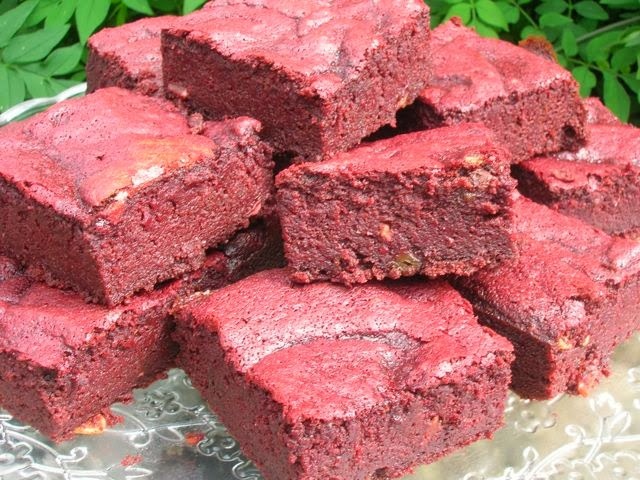 I had a go at making beetroot brownies a few years ago and seem to remember thinking they were more like cake than brownies. However, that was a while ago and I thought another attempt was in order. In retrospect, I recalled making these beetroot & almond chocolate squares which definitely got the thumbs up. Never mind, there’s always room for more beetroot brownies in our life. Orange is a classic flavouring to pair with beetroot, so this seemed like a good place to start. I had some orange and almond Lindt chocolate I thought would work and I reasoned that adding a slug of orange liqueur could only make things better. These beetroot orange brownies were definitely gooey rather than cakey and they had the classic crackly top; after due deliberation, I awarded them full marks. Even more remarkably, CT, who is not at all a beetroot fan gave them the thumbs up. The crunchy pieces of almonds in the orange chocolate contributed to the texture and added to the overall pleasure. But it’s fine to use ordinary dark chocolate if that’s easier to get hold of. Just grate the zest from an orange into the brownie batter instead. Ness over at JibberJabberUK is hosting We Should Cocoa this month and has chosen vegetables as the surprise ingredient. 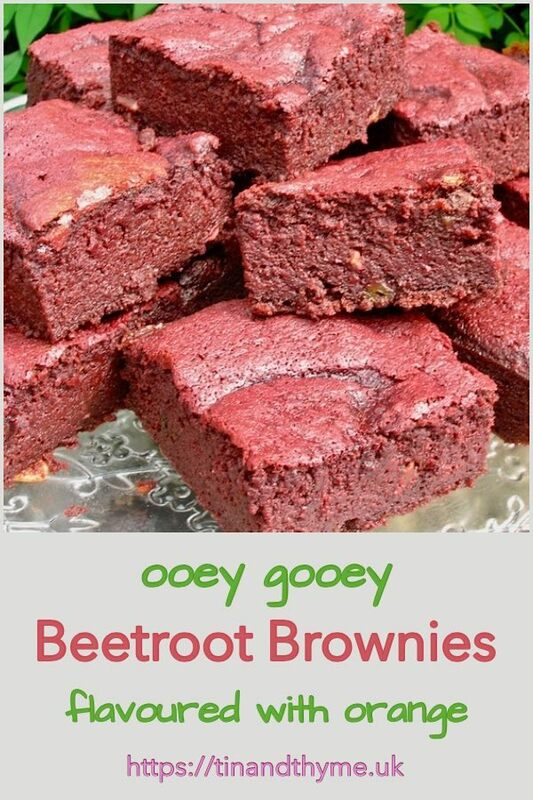 This gives plenty of scope and is just right to showcase my recipe for beetroot orange brownies. As the brownies are made from scratch and with our own beetroots too, I’m submitting these to Javelin Warrior’s Made with Love Mondays. With all those homegrown beets, this is a slightly cheaper brownie than it might otherwise have been, so I am submitting it to Credit Crunch Munch which is hosted this month by Michelle of Utterly Scrummy Food For Families. This is a monthly challenge normally hosted by Fuss Free Flavours or Fab Food 4 All. I’m also entering these beetroot orange brownies into the No Waste Food Challenge with Turquoise Lemons. The theme is root vegetables this month and I had a mass of beetroot I did not want to waste. Beetroot Orange Brownies. PIN IT. A soft but gooey brownie with a good orange flavour and a delightful purple colour. Melt the chocolate and butter together in a pan over very low heat. Stir until smooth, then allow to cool. Puree the beetroot with the orange liqueur - I used a stick blender. Whisk the eggs and sugar together until the mixture is thick and has doubled in volume. Fold in the chocolate mixture, followed by the beetroot trying not to stir all of the air out of the egg mixture. Sieve in the flour and cocoa and fold in until just combined. Pour into a 9" (23 cm) sq silicone cake mould and bake in the middle of the oven at 180°C for about 30 minutes when the top should be firm, but the middle still a bit squidgy. Allow to cool in the mould, then cut into 16 squares. What an amazing colour! I was hoping for some homegrown produce this month for We Should Cocoa and I am glad you used your beetroot for such a great recipe. I need to experiment making cakes with it. Love your brownies! Wow they look delicious. I’m impressed they kept their bright red colour. I find beetroot always makes things lovely and fudgey. look at the colour on these beauties… I think I need the sunglasses out!… they look so good and what a fab combo… orange, chocolate and beetroot… gorgeous stuff! I’ve just planted my first lot of beetroot seeds here and will continue planting them every couple of weeks, this recipe could be just what I need in a couple of months. Love the interesting colour. Wows, love that colour! They sound amazing, not only flavour wise but texture wise too! Oh wow! Look at the colour! Just fabulous! Such gorgeous brownies, Choclette, and I love that these turned out more gooey than cakey – I’m a big fan of gooey! And the color is superb – and not a drop of food dye! They are SO pink! Are beetroots easy to grow from seed? Wow – they would definitely be a talking point. Love the colour! Gosh these look AMAZING! I’ve been wanting to bake with beetroot for ages now but was waiting for the right recipe to come along….this may well be the one! can’t believe the colour of these – despite them being so full of chocolate – that is a win win – I am not sure I will get a we should cocoa entry in this month – really love the theme but haven’t managed much baking. I’ve been meaning to come on over and comment on your beetroot brownies and how amazed I am at the colour. I’ve made beetroot brownies a few times and mine have never been that red. I note that you have boiled your and then pureed them, so I will be giving your version a try maybe even this month. I will have to omit the orange liqueur though as the kids will want some, do you have any other suggestions. Love the look of these! I hope we get a beetroot glut next year to do something similar!! Wow these look amazing! The next time I have a glut of beetroot I’m baking these. Love the addition of the orange flavour. Thank you for joining in the No Waste Food Challenge.